Want something for your kiddos lunchbox that they’ll (probably) gobble up?! While we don’t eat that many hot dogs, when we do I prefer to buy the Applegate uncured variety because its a healthier version, but somewhat more expensive! Thankfully my store has a BTS coupon right now, so I’ve been able to get a few extra packages for the freezer…so I can make more of these in the coming months for lunch boxes. Simple to include in a baking day lineup, simple to make, simple to freeze…and everyone will love them! Preheat the oven to 400. Spray 24 muffin tin cups with non-stick cooking spray. Prepare the cornbread batter by whisking together all the dry ingredients. Stir in the wet ingredients and let the batter sit for 10 minutes. 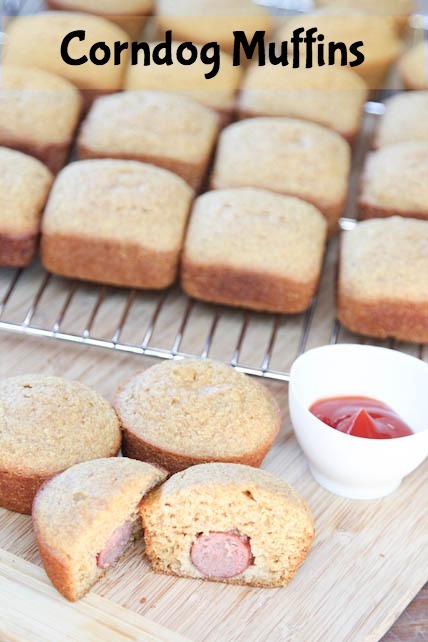 Drop a spoonful of batter into the muffin tin, then add a hot dog piece, then fill the muffin cup with more batter. If you want to make mini muffins, fill the cup half full, then press the hot dog piece into the middle of the batter, leaving some of the hot dog showing on the top. Bake in the preheated oven for 16 to 18 minutes, or until cornbread is cooked through in the center. To Freeze: Let cool completely before adding to plastic freezer baggie or container. Let thaw in the refrigerator and reheat in the microwave. If sending in a lunchbox, reheat them and drop them into a thermos container to keep them warm. This post is featured in Meal Plan Monday #9. Making these tonight for a fun Friday night dinner. I think the kids will love them. Thanks for the idea!